I have started feeding my levain with semolina. I had forgotten how much it loves it... grows so fast triples in a couple hours. This is another 1-2-3 tripled with additional water . 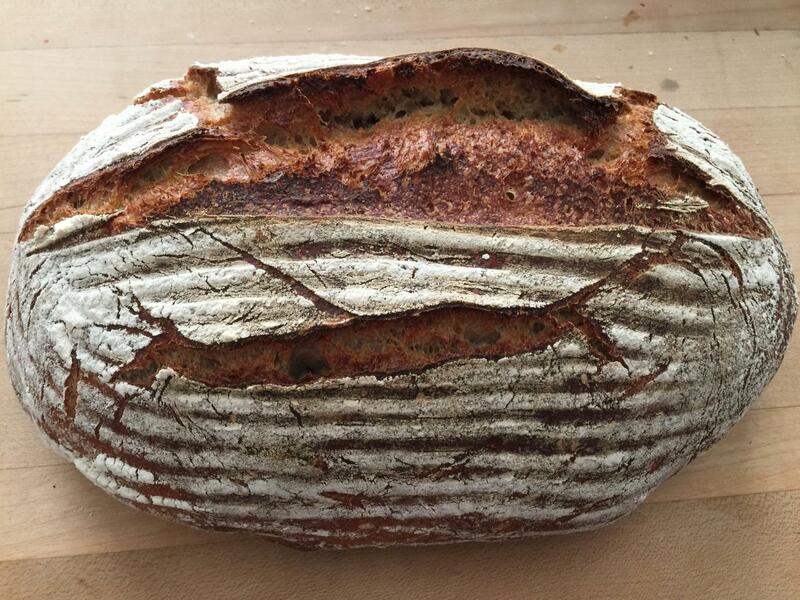 I don’t measure but probably 100 g . The barley ,I think, is responsible for the incredible taste of the last bake and the color of the finished bread. Will report when it is cut. Mix all but salt just til wet. Let set one hour. Fold in salt misted with water using a large rubber spatula. Place in PAM sprayed bucket and let rest 30 min. Dough turned out on wet counter patted out to huge rectangle about 1/2” thick. Dough very extensible and had gotten poofy in bucket. Folded up left to right like strudel then folded top over and bottom up and placed in bucket one hour. 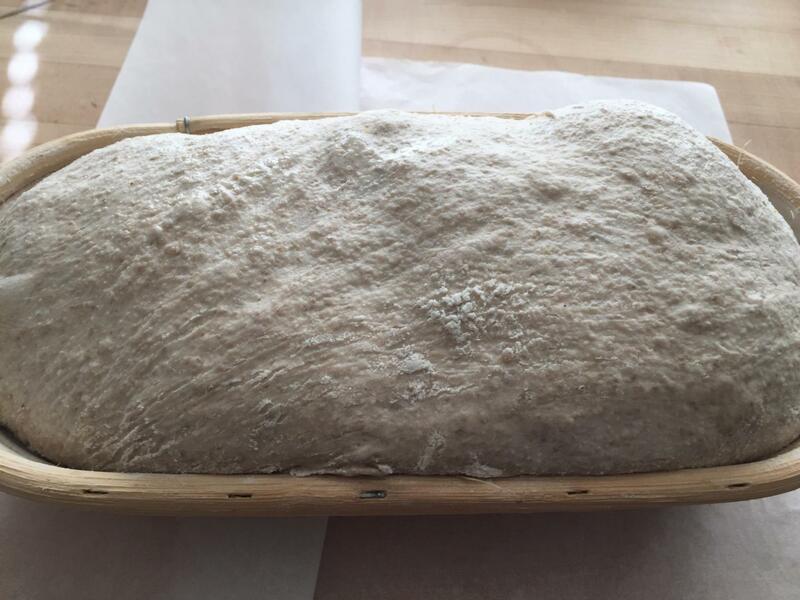 Removed and patted out again.... amazing gluten sheath at this point and dough very poofy. Same folding procedure and back in bucket for one hour. Barely 25% growth but very very light. Turned out onto floured counter divided two approx 900 g pieces. 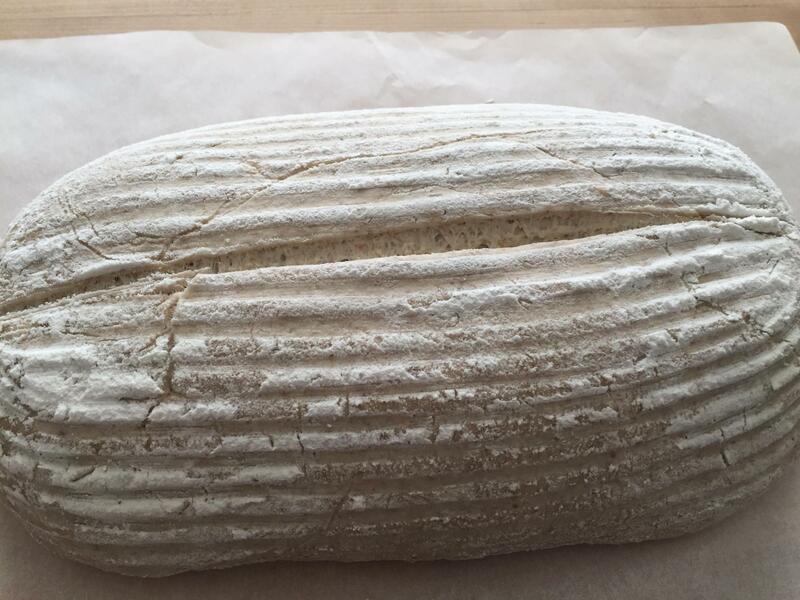 Lightly shaped by pulling in four sides to make boule and folding to make rough shaped batard and placed in banneton seam down. Covered and retarded 12 h.
Pictures tell the rest. Graniteware roaster at 500 while oven preheats approximately 15 min. Bake 10 min at 500 covered then 10 min at 475 still covered then 25 min uncovered at 475. Ears and musical crackles . Stopped using ice cubes awhile back... not needed. 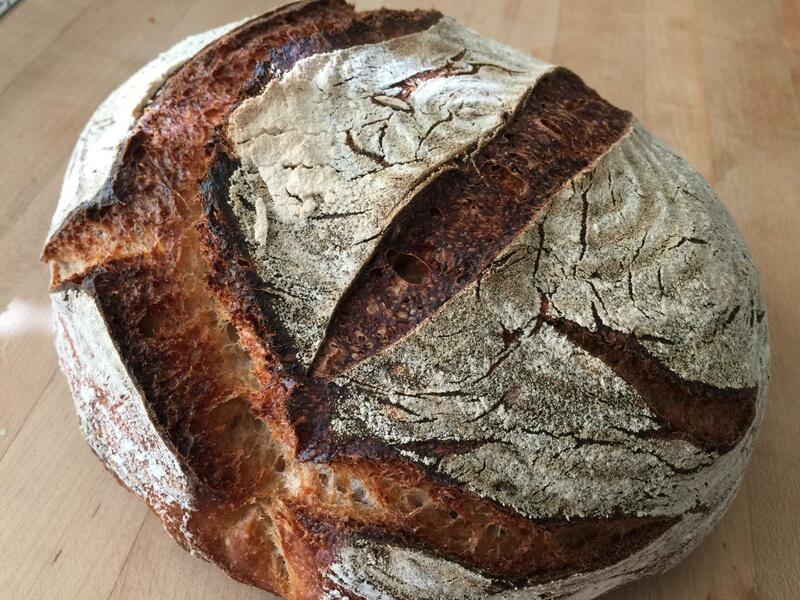 Amazing gluten development with almost no hands on. Very little bulk proof. I don't score the bread but let it open naturally which is why I barely shape and then place the bread shaped side down so it will be on top and open as it will. I do take my serrated bread knife and lightly trace one line the length of each loaf but all the rest is just whatever the bread wants to do. I will post a crumb shot in a bit. One loaf is a present . I like you scoring combined with the natural splits. Nice looking breads. The dark color and splits look so appetizing. I don't know why cast iron is more popular than granite, I think it has better properties. Looks wonderful. I am curious about the patting down and creating the rectangle. How much air did you lose during that process? Is it a gentle patting? In going from a round shape (from the bowl) to a rectangle, did you work out from the center? Or stretch the corners and leave the middle untouched? Doesn't seem to have harmed the final result, which is a nicely uniform crumb. i don’t do any other gluten development except the two x lamination fold. I let time do my gluten development. As far as losing air it isn’t a concern that early in the development. The first lamination there is insignificant puffiness. The second lamination an hour later there is more since I know what I am doing is development of gluten I am not concerned. By the next time there is considerable puffiness and I don’t do anything but my “ nonshaping “ shaping. I then place in the banneton and immediately into the cold retard. my dough is in a tall round bucket. I turn out the dough and pull it lightly to get it started and then pat gently/quickly into a very large rectangle. My dough always does this quite easily due to the extensibility from allowing it to develop first without the salt and then with the salt before I “ mess” with it. As I do the “ strudel” fold I easily gingerly lift the dough to incorporate air as I fold it. 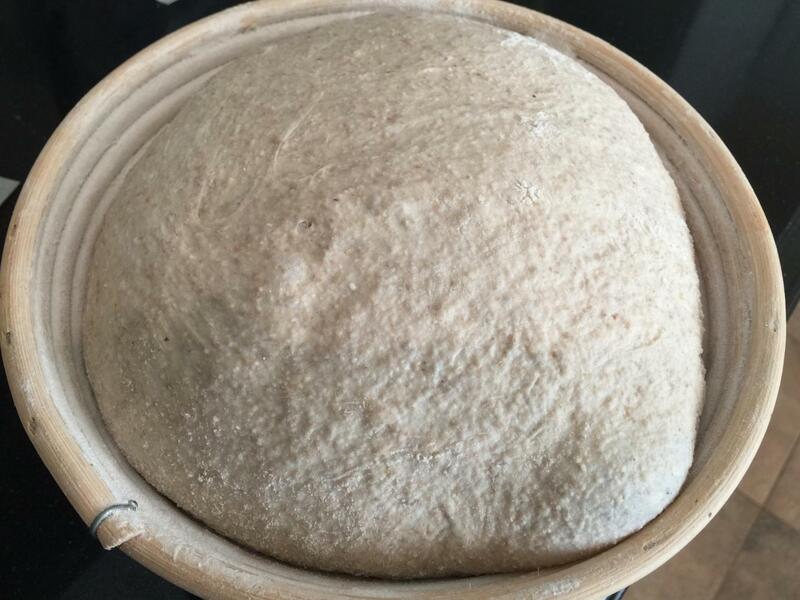 My dough is about 20-25% growth only during bulk. It grows quite a bit during retard as you can see in pics... over the top of the banneton. And there is plenty of spring left when baking. I don’t think worrying about losing air while the development of gluten is going on is important. 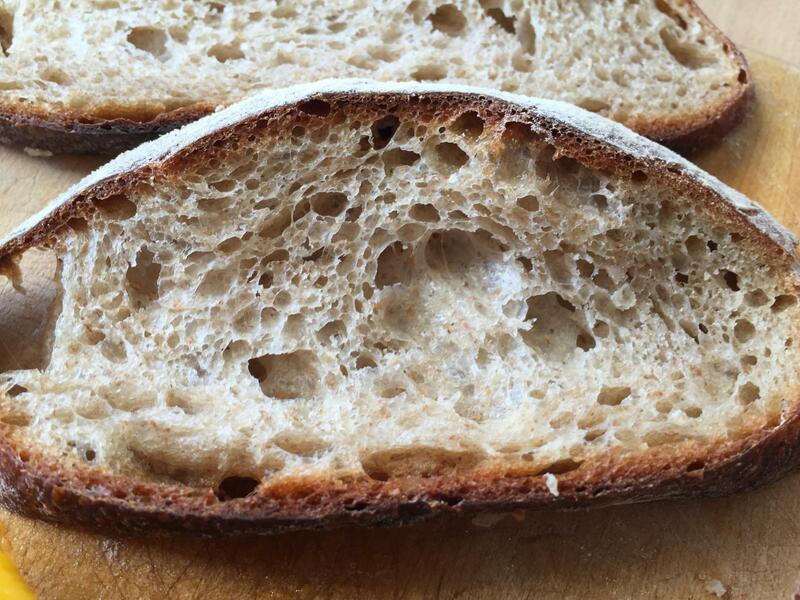 My crumb is always perfect ... I don’t strive for large holes just a beautiful even crumb and very thin crisp crust. I think I’ve got a good system going at present. You know how much Imlive durum so this one is right up my alley. I can imagine grilling some with some good olive oil brushed on top would be perfect. to feed your starter semolina! I’ll have to try that. 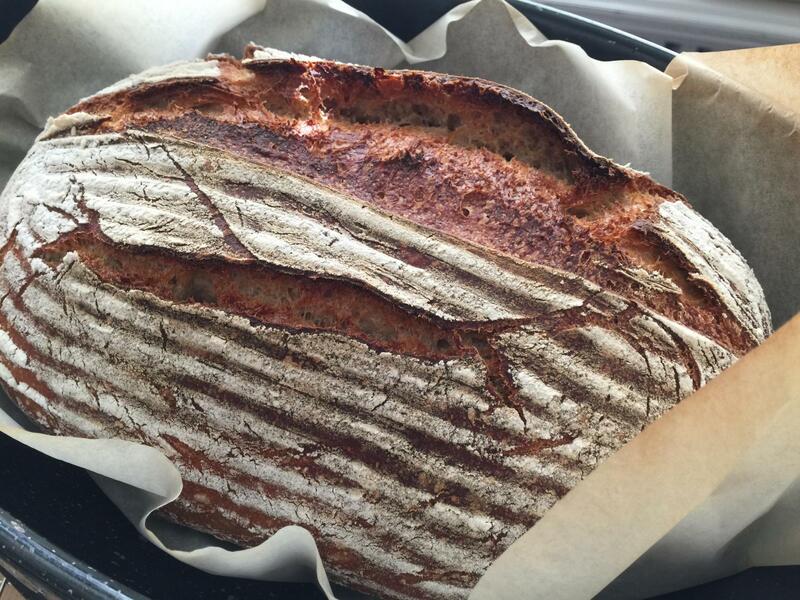 And your loaves are just gorgeous!